Here the beetle is darker than the day before, but still rather orange. 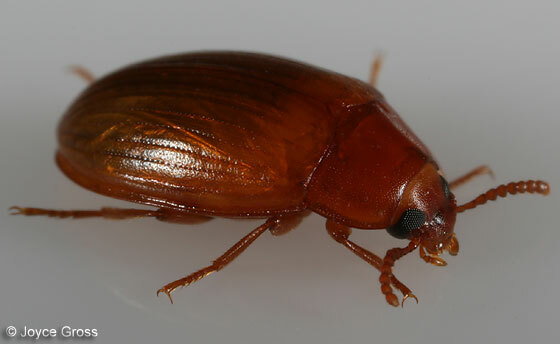 Unfortunately I released the beetle back to the park before it became completely dark brown, as another adult that emerged from the same fungus became (but don't have a whole series of photos for this other one). series and excellent images as usual! It was fun seeing what the larvae turned into. It's amazing how many insects a 3/4 inch diameter polypore fungus can support. I got a few tiny flies out of it, an ichneumon wasp, many ciids, and 5 or so tenebs. those wasp images are amazing.